A unique mobile interactive experience from conservation charity Bumblebee Conservation Trust is to help secondary school students learn about the importance of bumblebees and how to help these struggling pollinators, thanks to National Lottery players – by using larger-than-life models, ultraviolet vision and a mobile laboratory. In a world-first, Bumblebee Education Experience or B.E.E. – launched today at Chatsworth in Derbyshire, and funded by the Heritage Lottery Fund – takes the latest science to secondary schools, bringing to life in a vivid and dynamic way the world of bumblebees, their crucial role in pollinating our food, and why action is needed to reverse a crash in their populations. 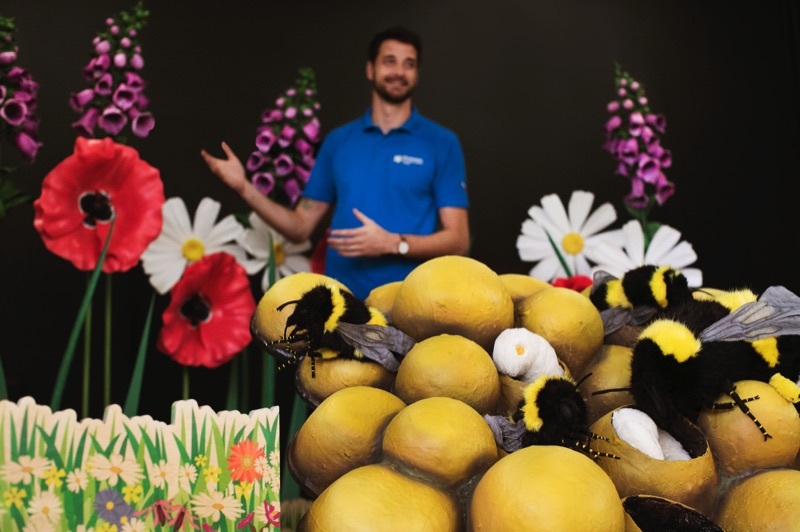 The portable pop-up roadshow has been given the 'wow' factor thanks to detailed giant models of the rare Bilberry bumblebee (Bombus Monticola), flowers showing how bumblebees use ultraviolet markings to locate pollen or nectar, and a bumblebee nest. The curriculum-linked initiative has been developed through Bumblebee Conservation Trust's Pollinating the Peak project. Starting this month, B.E.E. is being offered as a free resource to secondary schools in the Peak District and Derbyshire, with a potential future rollout to other regions across the UK. “This is a new and different way of inspiring students to make connections with nature, and to discover more about bumblebees and their importance – including how losing our pollinators would mean saying goodbye to fruit and vegetables like strawberries, tomatoes and peas,” said Gill Perkins, Chief Executive of Bumblebee Conservation Trust. B.E.E. is transported to schools in a striking van, decked out with images of different bumblebee species. 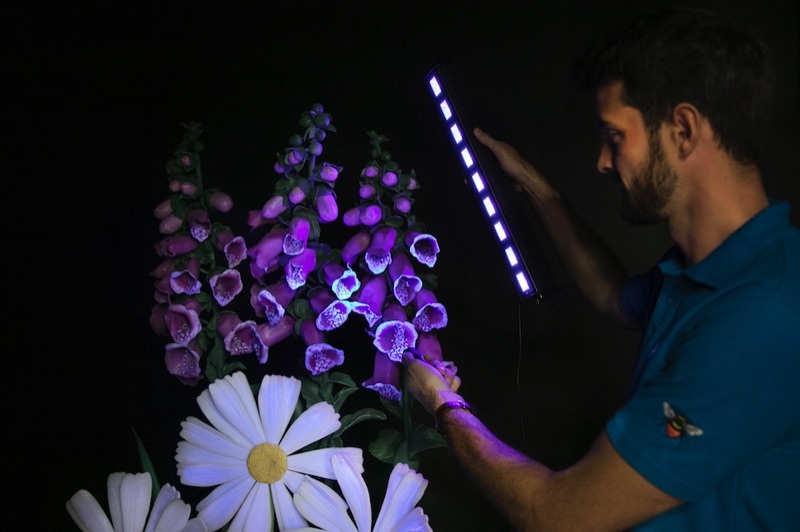 An accessible show for large groups of students or school assemblies then uses the over-sized models, ultraviolet light and images to tell the story of bumblebees – and the crash in their populations over the last 80 years, with two species becoming extinct in the UK. An interactive display highlights how loss of flower-rich habitat is the biggest threat to bumblebees' survival, with only three per cent of UK wildflower meadows remaining compared to before World War II. The show also explains how people can help bumblebees by planting suitable flowers, making gardens and farmland bee-friendly, and monitoring bee populations. B.E.E. also offers an immersive classroom-based science workshop – allowing smaller groups of students to use top-quality science equipment and microscopes to delve deeper into the world of bumblebees, and to use hands-on scientific skills includingpollen analysis and bee identification. The education package can be used flexibly to suit schools' requirements, and is especially suitable for years 7 and 8. It is entirely free for schools, having been funded by the Heritage Lottery Fund and Duke of Devonshire Trust. Students will also be able to gain advice on careers in conservation. “B.E.E. is a completely free resource for schools. It links to the curriculum in exciting and engaging ways – including in science, geography and citizenship – and contributes to students' development on issues such as social responsibility and mental health. We also hope to inspire future entomologists and conservationists!” said Andy Benson, Pollinating the Peak's Education Officer. A promotional pack is being sent to schools throughout Derbyshire and the Peak District this month. For details or to book a B.E.E. school visit, email andy.benson@bumblebeeconservation.org or call 07840 050642. The Pollinating the Peak project is transforming the Peak District and Derbyshire into a pollination hotspot by creating and restoring flower-rich habitats, monitoring bumblebees, and raising awareness about bees and how to help them. Conservation action is being taken to protect the Bilberry bumblebee, which inhabits Peakland moors. Bumblebee Conservation Trust is running Pollinating the Peak with partners Chatsworth, Chesterfield Borough Council, Derbyshire County Council, Derbyshire Wildlife Trust, Little Green Space, Moors for the Future Partnership, National Trust, and Peak District National Park. Bumblebee Conservation Trust was established in 2006 because of concerns about the 'plight of the bumblebee'. See bumblebeeconservation.org.